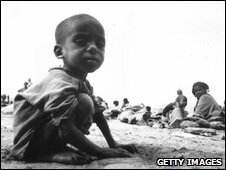 Images of the famine in Ethiopia moved millions of people around the world to reach in to their pockets and donate to international aid efforts. But as Martin Plaut has been discovering, there is a disturbing allegation few would choose to confront. It was the early 1980s. 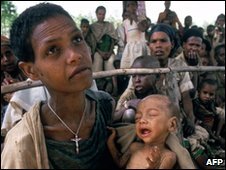 The famine, which would soon devastate much of northern Ethiopia, was already evident. I had gone on the long, difficult journey through Sudan and into Eritrea with rebels who had been fighting the government for more than 20 years. My wife, Gill, had come with me. As a nurse she was fascinated by the way the rebels were treating their injured, carrying out difficult operations in makeshift wards dug into the mountains. But now it was time for me to go up to the frontline and for her to go home. It was late at night, and I remember wondering to myself what I would say to her mother if anything went wrong as Gill got into one of the aid lorries rumbling their way back to Sudan. Sitting in a bunker, I had no idea where we were in this vast, arid landscape. I was entirely reliant on the rebels who had brought us in. For years the rains had failed and by 1984 millions were starving. But, kickstarted by Michael Buerk's reports for the BBC, people responded as never before. Millions of dollars were raised. Food was brought in. Many died, but the worst was averted. Then a year ago, I began hearing a different take. I was contacted by Ethiopians who said we had all missed the real story of how money given with such worthy objectives had ended up being used to buy weapons. Aregawi Berhe is the former army commander of the rebel movement that operated in the Ethiopian province of Tigray. He now lives in a modest flat in the back streets of a Dutch town. He insisted on making me coffee. Then he told me his version of what took place all those years ago - how the lightly-armed rebels he led took on the mighty Ethiopian army which had all the latest Soviet weaponry. He told me that as the money began flowing in to feed the starving, a bitter debate had taken place inside the rebel movement. There were divisions over how the cash should be spent. 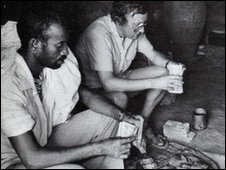 He also explained how the aid money was diverted not just to buy weapons his troops needed, but also to build a hardline, Stalinist party - the Marxist Leninist League of Tigray. This initiative, he said, was led by a young ideologue, Meles Zenawi. In the bitter infighting, Aregawi and his allies lost out. Money that was being channelled through the rebel side went to the party and to buy guns. In 1985, Aregawi told me, just 5% of $100m (£65m) they received went to the starving. It was an extraordinary tale, but perhaps Aregawi and his associates were just embittered men, trying to blacken the names of their former comrades? After all, Meles Zenawi went on to become Ethiopia's prime minister and served with distinction on the Commission for Africa set up by former British prime minister Tony Blair. So over the next months I spoke to people from Alaska to Australia, from Scandinavia to Palestine. I accumulated evidence from secret CIA reports. Former ambassadors supported the story Aregawi had told me. Facts were found in the dusty back issues of obscure newsletters. Even former Ethiopian government officials, who had been on the government side of the conflict said they believed it was true. Was it significant that so many people refused to speak about these events, including civil servants, academics and politicians like Meles Zenawi? It became clear that 25 years on, this was still a subject too sensitive to be discussed openly. One person who did talk to me was Max Peberdy. He is an aid consultant, who had carried nearly $500,000 (£331,000) in local currency into Tigray to buy surplus grain to feed the starving. Despite telling him the evidence I had collected, he insists the money did not go astray. I pointed out that he had been entirely reliant on the rebels to take him in, and that their Marxist-Leninist ideology ran counter to every notion of an independent aid operation. I also explained that he had been unable to monitor the distribution of aid in the Ethiopian highlands that were the scenes of the most intense fighting. As I left his London home I thought back to when I waved goodbye to Gill with an Eritrean fighter by my side. I thought about just how isolated I had been - entirely dependent on the rebels who had taken me in. And how I had failed to ask the right questions at the time. Although I was now finally following the trail of the money and the rebel guns, I am only too aware that I was making these enquiries 20 years too late. The aid workers who did so much to help those suffering back then had not asked those questions either. But perhaps they would not have saved so many lives if they had. Correction 4 November 2010: This page has been amended following a complaint by the Band Aid Trust, which was upheld by the BBC's Editorial Complaints Unit.